hours, 23 minutes and seven seconds. 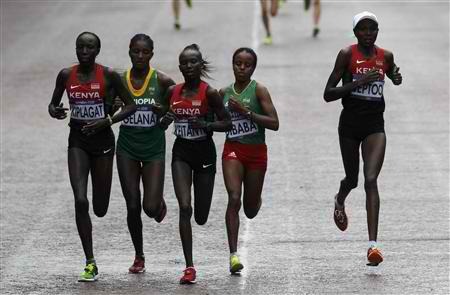 Kenya’s Priscah Jeptoo claimed silver and Tatyana Petrova, of Russia, came third for bronze. Great Britain’s Mara Yamauchi, 38, pulled out just before the 10km mark. Yamauchi was sixth in the 20008 Beijing Olympic marathon but has since struggled with injury. — Surging into the lead in the last mile and a half and running the second half of the race more than three minutes faster than the first, Tiki Gelana of Ethiopia won the women’s Olympic marathon on Sunday in 2 hours 23 minutes 7 seconds, a record for the Summer Games. Priscah Jeptoo of Kenya took second in 2:23:12 on a cool, rainy day on a loop course that passed many of London’s iconic landmarks. Tatyana Petrova Arkhipova of Russia made a late charge and finished third in a personal best of 2:23:29. She had finished fourth in the 3,000-meter steeplechase at the 2008 Beijing Games. The prerace favorite, Mary Keitany of Kenya, who won the London Marathon in April, could not hold the pace at the end and finished fourth in 2:23:56. (Jeptoo said Keitany had cramps in her back.) Surprisingly, a Kenyan woman still has not won an Olympic marathon since the event was first held in 1984. Meanwhile, Kenya’s East African rival, Ethiopia, has now twice won the Olympic marathon. Fatuma Roba took first at the 1996 Atlanta Games. At the London Games, Ethiopia has won both women’s distance events, with Tirunesh Dibaba taking gold in the 10,000.